ED260C If You Expriance Any Issues With Your Order Will Response Within Hours As We Put Our Customers First . SIZE: 8.5"W x 5.5"H / CEILING CANOPY: 5.5" / Wire 60" (Adjutable) / Color: Clear/Black / 40W EDISON STYLE BULB(S) INCLUDED / 60 watt max, 110-120 Volts, / Vintage Style / Edison / CE APPROVED / Dimmable / Installation by an electrician is recommended. Intended for indoor use VINTAGE STYLE - These are the PERFECT PENDANT LIGHTS for adding a VINTAGE LOOK AND FEEL to any space, whether your remodeling or adding it to an existing room. 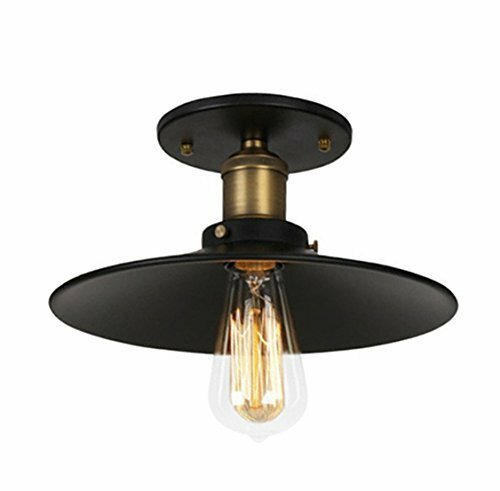 This OHR LIGHTING PENDANT LIGHT FIXTURE FROM THE EDISON COLLECTION will add a beautiful contemporary Vintage/modern touch to your house. QUALITY - Exceptional quality guaranteed, as a result, our lighting fixtures is widely used in HOUSEHOLD and COMMERCIAL LIGHTING. PERFECT FOR- Bars, Coffee shops, Restaurants, Bedrooms, Backyard, Showrooms, Clubs, Living rooms, Dining rooms, Kitchens, Showcase, Malls, Art rooms, Museums, and more! AWESOME CUSTOMER SERVICE GUARANTEED - If you experience any issues with your order, OHR LIGHTING will respond within hours, as we put our CUSTOMERS FIRST! Together with our GREAT VALUE PRICE, we have become a FAVORITE in the industry.